A record for a change. Herb Garden from Bristol. Originally signed to the 'Words Of Warning' label from Newport, then picked up by Warner's in Europe. Toured extensively with the likes of Decadence Within & fellow Bristolians Zygote. Played South Wales often with Cowboy Killers & Rectify. Hard to pigeon hole this lot. Touches of Killing Joke, No Means No, Bad Brains with a slight 'crossover' element which doesn't grate. Bloody good I call it. 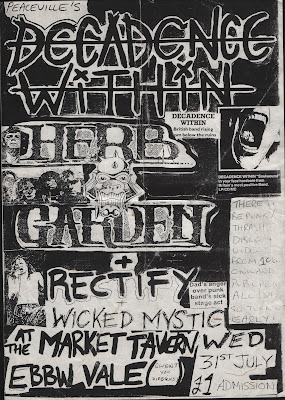 Flyer from when they played Ebbw Vale with Decadence Within & Rectify. Great night I seem to remember. Hey John, great post. I used to have an LP of these, can't remember what it was called (had a red cover I think). Anyway just listened to this now and quite liked it. Good for first thing in the morning. Cheers. I only have HMS Disaster, so it's very good to hear some new (to me) stuff. Saw them live a few times, back in the stone age, and very good they were too.Me likey! Stig, it was probably HMS Disaster which irishdave is refering to below. Glad you like this as well. I've had so much off your site, it's nice when you can give something back. Nice of you to drop in. irishdave, a fine live band they were. Used to run around and jump about like loons, like early Instigators used to. One of those bands i'd keep running into as they seemed to be support band everywhere for a while. I think Warners thought they had the next Therapy? when they signed them. Yeah twas the stone age. I too had a few good nights out when this lot were on the bill, cheers for the upload and memories. yeah good those pics, i'd already linked them in the post. If you click the rear sleeve it takes you to the site, something I always do with sleeves. One of those bands you can find hardly any information on the internet. Which is a shame I think. Next time your having a pint with one of them tell them. And buy them a pint of Blackthorne from me. Doh! Sorry, I just assumed they were links to the jpegs! I'll know now for next time (Alzheimer's permitting).